Portrait: How do you say 'Streetwear' in Italian, Luca Benini? For our brand new Italian Issue we talked to several insiders and industry veterans. One of them is Slam Jam, an Italian Streetwear heavyweight that cannot be defined according to usual schemes or patterns. After almost 30 years, it continues to be unique in the Italian and European scene due to its founder Luca Benini’s holistic approach to streetwear as a lifestyle and state of mind. Founded by its owner Luca Benini in 1989, Slam Jam has evolved significantly through the years. This hard-to-be-labeled company started serving the Italian underground fashion scene long before a segment later called “streetwear” existed. Slam Jam took its first steps as Europe’s first importer of brands that were unknown in those years–such as Stüssy, for example. While distributing such brands, it also acquainted the Italian consumer to a wider world and culture tied to music, clubbing and street sport initiatives, and connected tribes of like-minded people. What we sell is way more than just T-shirts. Benini started his journey by opening a small warehouse on the rural outskirts of Ferrara. It since has become a cultural institution that promotes urban subcultures globally. Among its most recent initiatives were “Beautiful Losers,” a street-art exhibition held in 2006, the international skateboard contest Slam Trick, and the co-founding of Spazio Maiocchi, a new 1,000-sq.-meter venue in the heart of Milan. This hub, created in collaboration with Carhartt WIP, a brand Slam Jam has worked with for a long time, also synthetizes Slam Jam’s creed to bring together art, fashion, culture and design for its community of fans and also proves that beyond its distribution business it functions as retailer, licensee and cultural hub. Slam Jam has grown through the years and has extended its business beyond just distribution in Italy to an international reach and through on- and offline retail. I’ve always picked labels I could relate to, I felt were true and with a genuine identity. In September 2016 it inaugurated its Milan flagship store at Via Lanza 1. It has also opened an area of its Ferrara headquarters’ gates to customers where the public can visit its e-commerce activities (aka Socialism) and also make direct purchases. As part of its development, Slam Jam has gained further expertise in various fields and started offering consulting services in terms of branding, marketing and creative support for third parties. One of its most recent collaboration is the licensing agreement for Kappa Kontroll, a top-tier collection of the Turin-based historical brand managed by Slam Jam from design to distribution. Slam Jam’s evolution has happened in a very natural and organic way. Exactly like luxury brands that are trying to connect with younger generations, Benini has long understood that the way to woo them was much more than simply offering products, but also required establishing communication through storytelling and sharing interests. Thus his company was not forcedly running after its consumers’ interests but involved them to be part of a community while creating a cultural and artistic context to give value to down-to-earth streetwear. We also want to focus on further expanding our retail experience and increase our efforts in production. Growing constantly though organically will remain as one of Slam Jam’s top aims: “We aim to strengthen our presence in Milan, online and wherever we can find the right conditions to replicate Slam Jam experience–not necessarily on a permanent basis, and that could be everywhere really.” He continues: “Expanding our international distribution for sure is part of our plans. 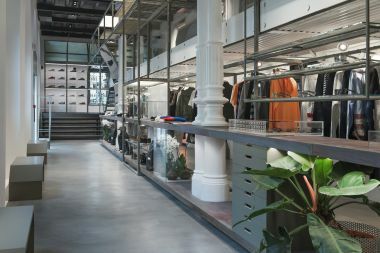 We also want to focus on further expanding our retail experience and increase our efforts in production.” (Benini is partner of designer Mattthew Williams for the brand ALYX). “I just do what I feel,” he adds, stressing how each action he takes is guided by passion and dedication only.